Will the Shanghai Composite Be the First Stock Market Bubble to Pop? China's Shanghai Composite stock index has two of the four warning flags flying, following the re-inflation of its stock market bubble. Here's how to trade the Chinese bubble. NEW YORK (TheStreet) -- Last week the Shanghai Composite plunged 13.5%. The reasons cited in media reports include a Chinese crackdown on buying stocks on margin or a huge wave of IPOs. These are two of the four warning flags for stock markets around the world. Let's explore whether or not the Shanghai Composite is a bubble ready to pop. Then let's look at one of the popular Chinese ETFs to trade, the iShares China Large-Cap ETF (FXI - Get Report). Here is the list of serious concerns. These are apparent in the U.S. markets and in some markets around the globe. As of the end of May, Chinese companies have raised $29 billion in initial public offerings since the beginning of 2015, vs. $15 billion in the U.S. In China, margin debt recently reached a record $358 billion at the end of April, which is 3.6% of the stock market cap. In the U.S., NYSE margin debt totaled $507 billion at the end of April -- a record -- but a lower 2.3% of the $22 trillion stock market cap. Another warning is too much euphoria by individual investors in China. As this bubble inflates, millions of new trading accounts have been opened each week. This number peaked with 1.9 million new accounts opened in May. The Shanghai Composite did not trade on Monday and had a roller-coaster ride on Tuesday. Last Friday, this index had a close of 4,478.36. On Tuesday the range was 4,264.77 to 4,577.93, with a close of 4,575.12, up 2.2% on the session. At Tuesday's low, the index was 17.6% below the multiyear intraday high of 5,178.18, set on June 12, but was still up 31.8% year to date. At the close on Tuesday, the loss off the high was cut to 11.6%. This type of volatility is typical of a market in a longer-term topping-out pattern. Let's look at the weekly chart for the Shanghai Composite, courtesy of MetaStock Xenith. Looking from left to right, the Shanghai Composite had a parabolic bubble that began to inflate in May 2006 from its 200-week simple moving average, then at 1,397.29. This rise of 338% ended with an all-time intraday high of 6,124.04, set in October 2007. This popped bubble bottomed at 1,664.93 in October 2008, before the U.S. stock market set its lows in March 2009. The decline for the Chinese index totaled 72.8%, compared to 57.7% for the Standard & Poor's 500 (SPY - Get Report). The re-inflated bubble for the Shanghai Composite reached a multiyear intraday high of 5,178.18 on June 12, up 211% vs. 220% for the S&P 500. At the recent highs, the Chinese index is 15.4% below its prior bubble peak, while the S&P 500 is 35.5% above its prior peak. Let's look at the Fibonacci Retracements, which are the horizontal lines on this graph. Notice how 38.2% of the Crash of 2008 was tested at 3,364.65 in July to August of 2009 and not again until January to February 2015. The major portion of the re-inflating bubble has been within the gain of 41.4% year to date. The index has been trading back and forth around the 61.8% retracement of 4,416.92 since the week of April 24. The weekly chart cannot yet confirm a market top. A close this Friday below its key weekly moving average of 4,556.51 will shift the weekly chart to negative if the momentum reading declines below the overbought threshold of 80.00. This reading is projected to decline to 81.29 this week from 87.82 on June 19. Here's the weekly chart for iShares China Large-Cap ETF. The China ETF had a close of $47.40 on Monday, below its key weekly moving average of $48.44. Note how the 200-week simple moving average in green has been a magnet since the week of Sept. 19, 2008, when this average was $33.33. Today this average is $38.10. The weekly momentum reading is projected to be 58.21, down from 67.61 on June 19. 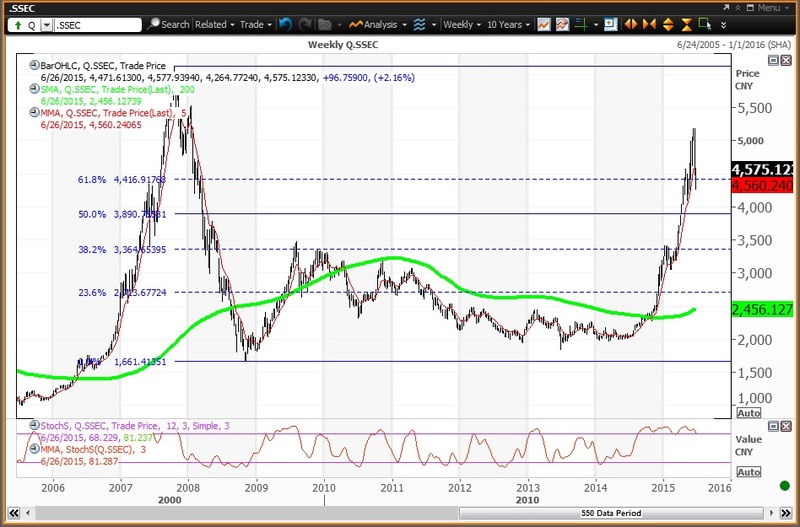 Unless there's a rally this week with a close on Friday above $48.44, the weekly chart will stay negative as a warning that the Shanghai Composite bubble is popping. Investors looking to buy this ETF should place a good till canceled limit order to purchase the exchange-traded fund if it drops to $44.67, which is a key level on technical charts until the end of 2015. Investors looking to book profits should place a good till canceled limit order to sell the ETF if it rises to $50.70, which is a key level on technical charts until the end of June. Investors not familiar with technical analysis should begin with the notion that a price chart for a stock shows a road map of past price performance, which provides guidance for predicting future share price direction. Here's how to read a daily chart. There are two moving averages to follow; the 50-day simple moving average is in blue while the 200-day simple moving average is in green. Here's how to read a weekly chart. This chart shows weekly price bars going back to the beginning of 2007 and thus includes the Crash of 2008, then the current bull market for stocks that began in March 2009. The red line tracks the ups and downs of the key weekly moving average. 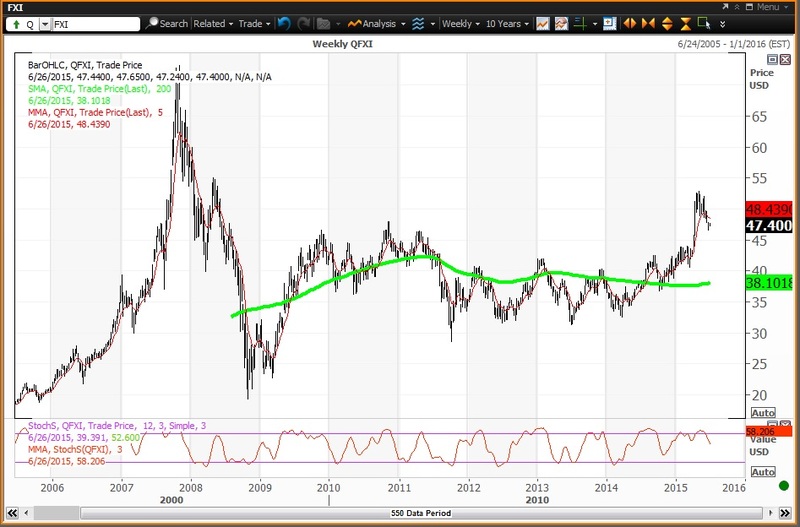 The green line is the 200-week simple moving average. The red line that oscillates along the bottom of the chart is the momentum reading on a scale of 00.00 to 100.00. A reading below 20.00 is oversold and a reading above 80.00 is overbought. A technically positive weekly chart occurs when a stock ends a week above its key weekly moving average with the momentum reading rising above 20.00. A technically negative weekly chart occurs when a stock ends a week below its key weekly moving average with the momentum reading declining below 80.00.